Lying somewhere between surgeons who perform appendectomies on themselves and biologists who eat what they study lies this recent instance of scientific self-sacrifice (or is it self-service?). 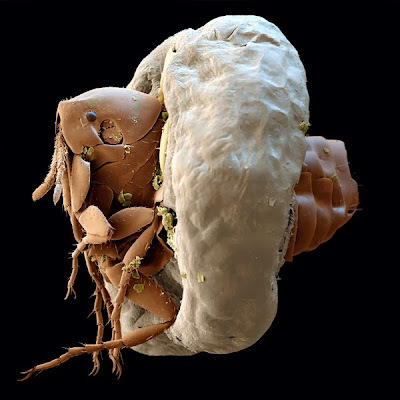 Marlene Thielecke, a doctoral student at Charité University Medicine in Berlin, was in Madagascar studying ways to prevent infection that local villagers get when the chigger or sand flea (Tunga penetrans) burrows into their feet (SCANNING ELECTRON MICROSCOPE IMAGE ABOVE). So when she found she had picked one up herself, she objectively evaluated it, took photographs of it, and recorded its developmental stages on video for 2 months before she extracted it. “I thought it might be interesting,” she comments, and in the process learned something new about the mating habits of the insects, which she and her mentors published in a paper. Thielecke ranks right up there with epidemiologist Tony Goldberg of the University of Wisconsin at Madison, who was studying the spread of diseases in western Uganda. Goldberg made news last month when he discovered that the tick which he unknowingly brought home embedded in his nostril was a potential new species.